Citrix Systems recently announced that it has acquired Kaviza, makers of an all-in-one “VDI-in-a-Box” solution for small and medium business. It complements the company’s XenDesktop product line for enterprise-class desktop virtualization. Kaviza VDI-in-a-Box is not just a scaled-down enterprise product, but instead gives SMB customers everything they need to “go virtual” with VDI in a single, easy-to-deploy software virtual appliance. 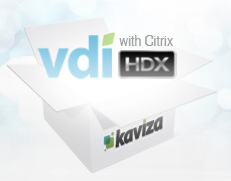 Customers can continue to purchase VDI-in-a-box from Kaviza resellers. Starting July 1, 2011 customers will also be able to buy from Citrix Solution Advisors.